Julius isn’t just a technology vendor, we’re an extension of your team. Our goal is to ensure you have the most successful adoption of our platform and achieve your desired business results. We support our clients on everything from account launches to research requests, thought leadership and more. With Julius, your success is our success. Our dedicated Customer Success Team will help you get the most value from the platform, including on-boarding sessions, additional research, and consultative campaign support. As a strategic partner to your influencer marketing strategy and needs, your dedicated Customer Success Team will work closely with your team throughout your Julius subscription term, providing consultative influencer marketing support, platform tips and tricks, industry/trade insights and more. Tailored sessions to hone in on research tips & tricks, campaign best practices, platform benefits, and more. Onboarding sessions are set-up by your customer success manager as soon as your subscription is activated. Virtual and/or in-person office hours. A typical agenda for office hours will include announcements around product roadmap, new product feature demonstrations, and ample time to consult with subscribers on any real-time campaign scenarios. Weekly or bi-weekly check-ins on platform adoption and usage data across the company. We’ll perform additional influencer research on your behalf for pitches, briefs, and RFPs to aid in broad or niche campaign needs. 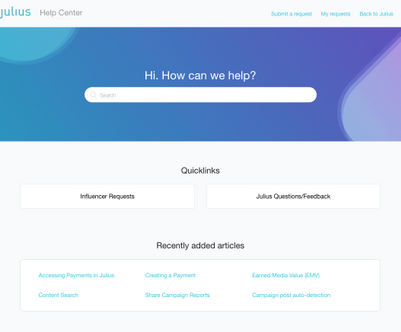 If you ever have trouble finding who you need on Julius, our Customer Success team will help you create search filters that populate results with influencers that meet your criteria. 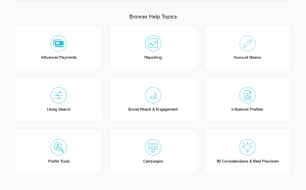 Never have a search come up empty – we’re here to help! 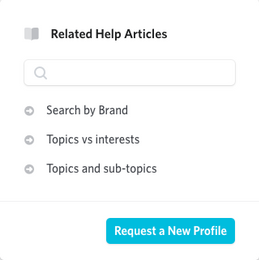 As a subscriber, you will have access to our help center where you can submit requests for adding specific influencer profiles, uploading your current talent roster, or seeing that we build profiles in appreciation of your search criteria. All requests are funneled to our research team based here in NYC who will research, vet, and build profiles on your behalf. 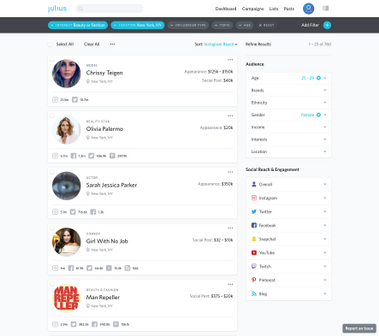 Need an influencer on Julius that you can’t find? Let us know their handle and we’ll add them to the database. 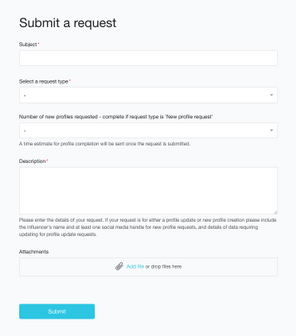 If you’d like us to upload your talent roster to Julius, just send us your file of influencers and we’ll upload them to the platform with all of your proprietary notes. Your influencer notes will only be seen by members of your account group so your data remains private and protected all in one place. Our influencer marketing thought leadership panel hosted across the country. Join us to weigh in on trending topics, industry challenges, and pressing issues while connecting with fellow marketers. Tune into our podcast to learn more about how marketers are successfully incorporating influencers into their core strategy. Audiences include brands, publishers, and agencies that are looking for thought leadership on how to successfully navigate the influencer space. Guest speaking opportunities, tickets, and/or exposure to learn and/or demonstrate your thought leadership in Julius presentations at industry events such as Digiday, ANA, Social Media Week, and more. Join our monthly webinars to review best practices, product optimization, and Julius tools to maximize ROI via influencers.